As a fresh-faced quarterback heading into hostile territory a season ago, now-sophomore Sam Ehlinger nearly led Texas to a double-overtime win against USC last year. A win this year would be doubly special, especially with the game on the Forty Acres Saturday, not to mention the magnitude of a Texas vs. USC affair. And the addition of fans believing the sky is not just falling but plummeting right now. Ehlinger, true to his nature, isn’t hearing any of that as Texas prepares for what is, once again, the biggest game of its season. Poised to turn Texas season into something special, the Horns ultimately fell 27-24 in an exhilarating and eventually heartbreaking contest in California at the LA Memorial Coliseum. Once again, the game will be under the lights on national TV and once again, the outcome of this game stands to tell the nation a lot about the Longhorns hopes, and reality. Perhaps it’s obvious but Ehlinger needs to get near last year’s numbers of 298 passing yards and two touchdowns — while eliminating the two interceptions, as well as the sputtering offense that keeps popping its head up this season. “Overall, our offense is moving in the right direction and the receivers are going and getting the ball, we're getting some push up front so that makes it a lot easier on the quarterback,” he said. Part of what put Texas in position to win last season has them there this year, too. That’s imposing and intimidating junior wide receiver Collin Johnson. The talented Texas wideout logged seven catches for 191 yards a year ago. He harkened back to last season and admitted it felt like a breakout game for himself and the offense. Coming off a narrow win over Tulsa in which many expected the Horns to come out firing and put up a crooked number in the 40s or even 50s, Johnson puts the game in perfect context knowing it’s a big game, and another game — the next game. Evening out the excitement and expectation while maintaining passion is needed for all four quarters, just not a half as Texas has shown sometimes. Senior leader Charles Omenihu was adamant that the team isn’t looking at this game out of scope. Though everyone knows this is not a normal game, acting normal is crucial leading up to the game — and especially vital in the game. The constant asking of players whether this is just another game in itself takes it from being a normal game to something special. Another senior defensive lineman, Chris Nelson, also revealed that Texas knows it needs to play special to win. Against USC, against everybody, because special is what will make this team turn opponents from special to normal. Seeing youngsters come into the fold the past few years, veteran tight end Andrew Beck knew almost immediately that his current QB had nothing but cool running through him. 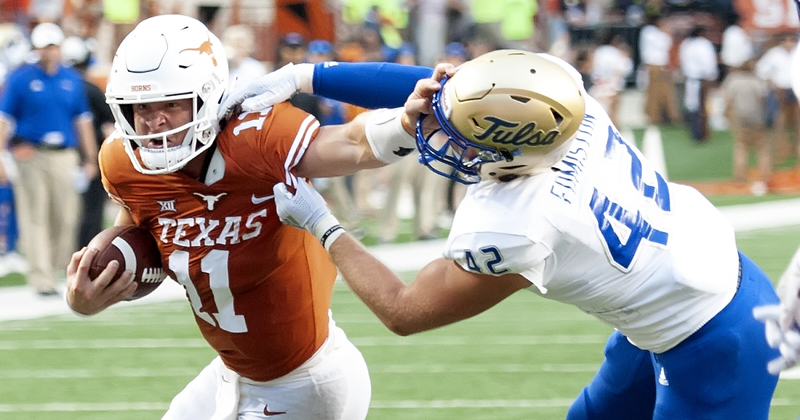 Parlaying that cool into the nitty gritty is something Ehlinger believes the offense has absorbed now, and he is ready to put that into action against the Trojans. That means during this spectacular contest of nationally renowned programs, going for the unspectacular. Keeping the offensive flow going, and wear the Trojans out. Locked in on how the Horns will perform this week against USC, plenty of attention goes toward the offense and when it will start humming again. Likely, though, the Horns defense will be the key to grabbing a victory. With freshman quarterback JT Daniels under helm for the Trojans this season, a veteran-laden squad infused with young talent like the Horns have has to make the youngster feel anything but normal Saturday. That pressure should allow the secondary to show it can blanket receivers and make game-turning plays. Against Tulsa, freshmen Caden Sterns and BJ Johnson snagged interceptions, something senior DB PJ Locke feels added immensely to the defense’s confidence ahead of USC. A year after Texas thought it had the game won on an Ehlinger touchdown only to see the Trojans rally and claim the win, the thought is the same — finish the game.